While planning for the upcoming holidays, remember that older adults may need extra care. Keep in mind that your parents and/or grandparents may not be as mobile as they were the last time you visited. As we age, we are also less inclined to drive in winter weather, heavy holiday driving times or after dark. Offer transportation options or suggest going to their home and bringing food items. Offering to take them shopping or sitting with them while you shop together online could create a fun time of visiting for both of you and provide a great deal of assistance. Adjusting traditions may help eliminate stress. Hosting the holidays can be stressful. Start the discussions early about how the rest of the family can contribute and reduce the effort required at holiday gatherings. Gradually reducing requirements each year will make stepping away from the responsibility easier and create new traditions that can be enjoyable and memorable for everyone. Listen to and encourage storytelling. Many of our older relatives live in their memories. Encourage them to talk about holidays gone by and to share pictures of times past. It’s a great way to validate their importance to the family and bring the family together for a shared experience. You may also pick up on ways to recreate an old tradition that will bring great joy to the aging members of your family. Give the best gift of all—your time. Unhurried, family time will mean the most to your loved one and creates memories to last all year. Today’s fast-paced world can be tiring. Being in the moment without electronics or other distractions can be good for you and the entire family. Keep the spirit of the holiday going. The weeks following New Years’ are often the hardest for those who are alone or who have limited mobility. As relatives and friends return home from holiday visits, our isolated loved ones suddenly feel very alone. Make it a New Years’ Resolution to spend more time with these relatives throughout the year. Sometimes we feel that we do so much for our loved ones on a day to day basis that we don’t think about actually spending time talking to and enjoying their company. Remember to make time to do that, and consider bringing a licensed agency in to provide the personal care needed so that you can do the things you enjoy most with your loved ones. Laughing over old movies, looking at photos or remembering wonderful events from the past can bring joy to your loved one and create a less stressful environment for everyone in the family. 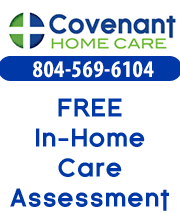 Happy Holidays from Covenant Home Care.